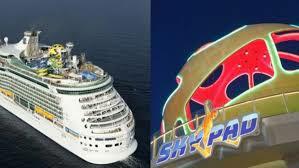 In the wake of a recent lawsuit Royal Caribbean has decided to temporarily close down its “Sky Pad” feature on two of its cruise ships. “As part of our commitment to safety, we are temporarily taking Sky Pad out of service on Mariner of Seas and Independence of the Seas,” the cruise line said in response to a question from the media. The move comes after the cruise line was sued by a passenger, Casey Holladay, 26, for $75,000. According to the suit, Holladay says he was on a weekend cruise to the Bahamas on the Mariner of the Seas in February when he plunged to the ship’s deck after the harness he was fastened to disconnected while he was 20 feet in the air. The lawsuit was filed in U.S. District Court in Miami on March 12.